ROHNA U GHENA B’EL SALAM! Remember? I had a dream………..
and this is the last part which confirms that anything the Shamrock Sisters want, the Shamrock Sisters do! My heartiest thanks to the schoolmates who are present at our Reunion and pity for those who couldn’t make it and who are however always on our mind. 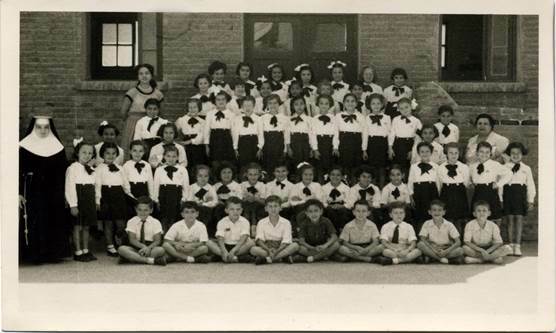 A tender thought for the ones who have passed away, Slawka, Nicole and Ivy forever in our memories and in our hearts as precious friends who have shared our school years and that have been part of our lives, of our special and particular life-style in our beloved and never forgotten Sacred Heart School and our beautiful Alexandria. 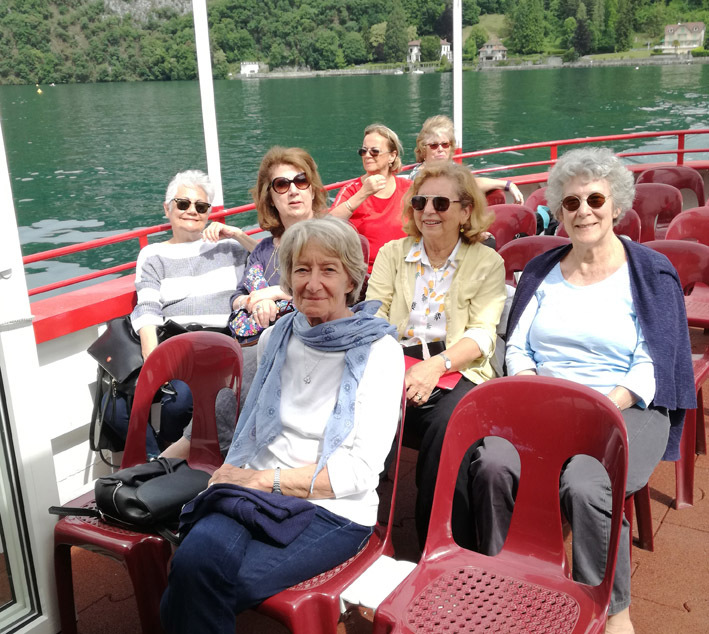 here I am back home and ready to give you all a very quick summary of our reunion held at Menthon Saint-Bernard on the Lake of Annecy (France). The weather forecasts said we would have had rain and storms each afternoon but luckily we were saved, rain poured only late at night while we were all fast asleep; except for our last evening when we were overcome by a rainstorm that necessarily changed our plans. I think I’d better start from the beginning, now. 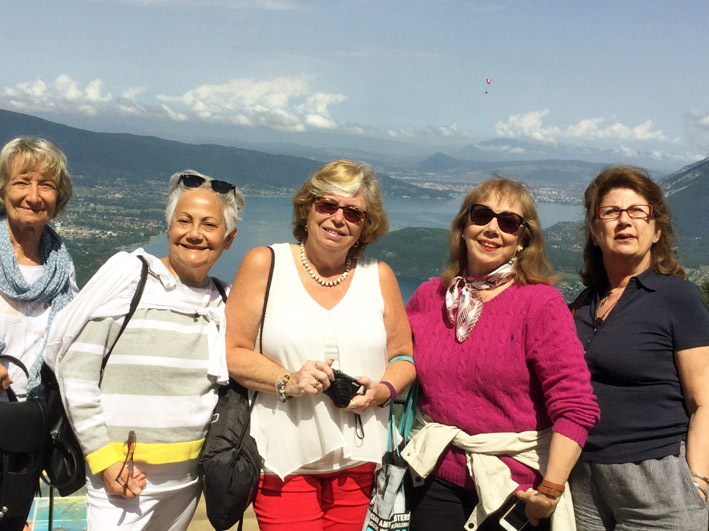 On Saturday morning, 26th May, Wilna, Marcellina, Anna Serena and I took our early morning train and headed towards Geneva. The trip was pleasant and joyful with plenty of chattering and all of us so eager to meet with our school friends. 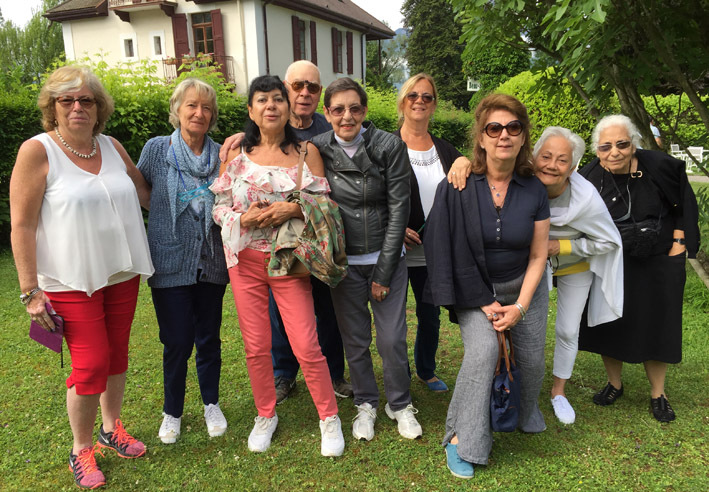 At the railway station there they were, waiting for us – Denise and Aurora – they had reached Geneva the evening before and had taken care of the taxi reservation to take us on the lake. What can words say, it was eight years since our previous meeting and so many events in our lives, especially for Denise. So, there were many warm hugs and tender thoughts. 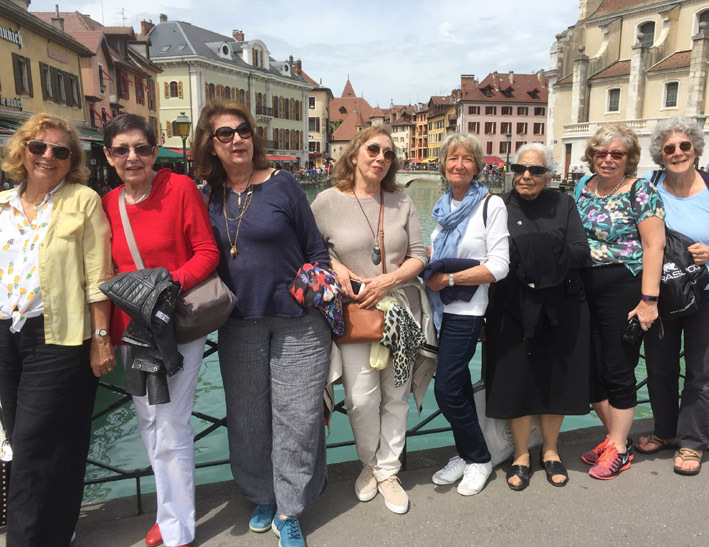 Then, straight to a nearby bistrot to have a quick lunch; soon after came Yuri our minivan driver who took us to our destination and there, again, another fill up of emotions as Marlène, Sylvia, Jenny and Wedad came running towards us. Most of you know how these moments work out, voices that overlapped, loads of hugs and kisses, tears of joy here and there, so much excitement for what we were about to live once more, all of us together. First thing we did was to settle in our studios that were pretty and quite comfortable and we are all absolutely grateful to Marlène who took care of all the reservations and had to deal with the owner, a modern Lady Macbeth who said a very clear NO to most of our requests. The good thing about all of us is that we can all cope with no matter which situation. During our vacation, we had beautiful blue skies in the morning so we often had breakfast in the garden and of course we faced plenty of arguments and tried to put all our thoughts together in order to plan our day in the most democratic way possible, having all of us agreeing and sticking to what was decided. So, besides our lunches and dinners with typical French food of the Haute Savoie (plenty of melted cheese and creams and also salted or sweet crêpes), we had a lovely tour of the Lake and stopped at Annecy sightseeing around trying to discover all the beauties that it offered and that was also an occasion to go shopping here and there, have ice-creams, cappuccinos or a glass of wine! 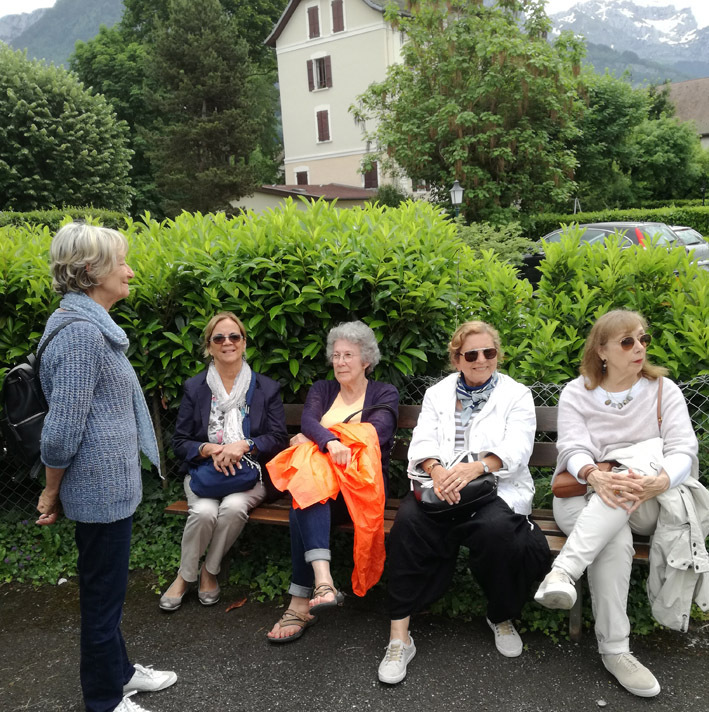 We used the local bus transportation to go from one place to another so we could visit a very nice little village on the bank of the lake called Talloires where we failed to visit a very ancient Abbey, which has become a luxurious hotel, because we didn’t know we could go in and see it!!! We visited though a tiny chapel and then walked around, waiting for Rosemarie and her husband Pierre who had arrived the day before and stayed with us for three days only. Marlène introduced her cousins to us and we spent a beautiful day with them. They took us all by car up to Clusaz, a tourist resort just beneath the French Alps surrounded by the majestic and breathtaking Mont Blanc. We had lunch at this mountain chalet from which we could enjoy a wonderful panorama, with the view of the lake and of the mountains. Of course, here too, there was plenty of shopping and pictures. We also visited a little chapel dedicated to Saint Anne, our virgin Mary’s mother, where most of us gathered, like we did in Florence, to say a silent prayer each one for her own priorities. We also walked to the centre of our village, went to the supermarket to buy all we needed, or strolled about finding nice places where to stop. Usually, once we were back at the hotel after dinner, if it wasn’t too late, we would sit in the living room for a drink with plenty of chatters and some gossip! 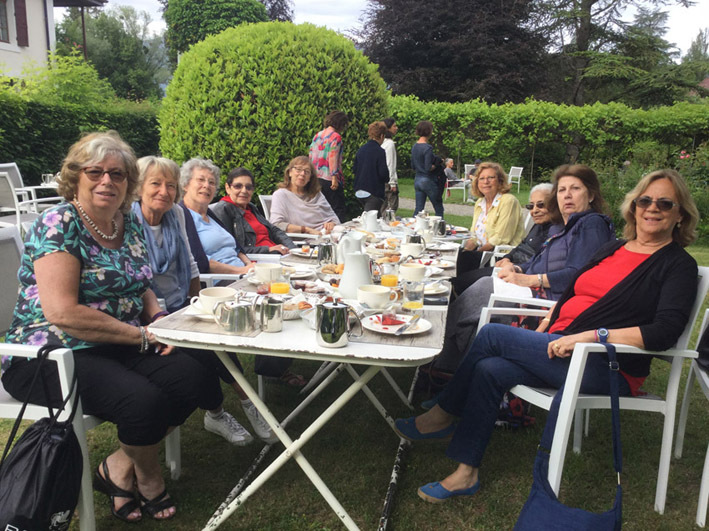 We were supposed to join Marlène’s cousins who had invited us to eat special crêpes for dinner but that evening the rain arrived earlier and we could not move anywhere…. Taxis were on strike so we were compelled to advise that we weren’t going out. Luckily, Dany, came to our place and then, together with Marlène and Sylvia, went to a Pizzeria and took back pizzas for all of us who could anyway enjoy their last night together. The day after, early in the morning at eight o’clock, Yuri was back again to pick us up and there we were, the eight of us, except for Marlène who was leaving late that evening and Sylvia who was going to stay with her sister in Geneva, ready to take the same way back home, but with so much more than when we had arrived. During the days spent together, there was a mixture of so many feelings that filled my heart and made me think that every single moment we lived was absolutely worthwhile. There was laughter, reminiscences, there was the memory of our childhood when our friendship began, there was nostalgia and melancholy for things gone by, there were also tears and sorrow for the expensive bills that life sometimes forces us to pay. Again, now, I wish to thank my darling Shamrock Sisters and I would like to start from Denise. Thank you for coming, thank you for taking the decision to share with us our reunion, for being part of the group. You have given us all a lesson of life being here with us. Thank you for the care and attention towards all. Next comes Wedad, our guiding light, thank you my dear for sharing your many talents with us; what a beautiful surprise for me to come to know better a strong-willed caring woman like you who can travel all night to visit her old uncle. Thank you for being so prodigal passing on to us all your knowledge in such a simple way. Thank you for your generosity, thank you for coming all the way from Sydney. Thank you Marlène for having taken the burden of all the reservations, thank you for sharing your lovely cousins with us, thanks for your helpfulness and care. Thanks to Aurora for her lightheartedness, for being always available and always with a sweet smile for everybody. Thanks to Rosemarie, whose presence was a real big gift for us all, pity she couldn’t stay for the whole week but we all wish to see her come along next time to spend more days together. Thanks to Marcellina for coming from faraway Canada, for being a clever, independent, practical, knowledgeable woman and a true friend. Thanks to Anna Serena for being such a big help trying to find solutions to no matter what happens, always ready to give a hand when necessary. Please remain just the way you are. Thank you Wilna for being so sweet and accommodating, Thank you my dear for being so careful and loving. And Sylvia? She is the one who better than all is able to find the funny side of complicated situations, she has remained the way she used to be in school – quite bubbly and sparkling, just like the finest champagne! I know she has a beautiful heart from the way she spoke about her grandchild Louisa that which makes me love her so much. Last, but not least, here comes Jennymou chérie, who shared the studio with me and with whom, in spite of one whole week’s talks, even by night sometimes, we have still not finished telling to each other all we meant to. Thank you my darling for being so understanding, for being more than a sister to me, for all the love and care you always dedicate to me and to my family. With all my heart, a big warm hug to each one of you. Indeed, we all know how true these words are! MARLENE KHERALLA FROM SARASOTA (FLORIDA) U.S.A.